Chris & Kim Comer are a true inspiration to many! They are a brother and sister that would do anything for one another, even if it means Kim giving one of her healthy kidneys to make Chris’s life more extraordinary. They are undergoing the surgery on November 29th 2012 and if everyone can make a donation for both Chris & Kim it would mean the world to them and their family. 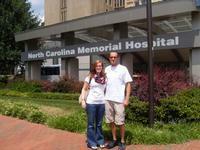 The money that is donated goes into a non-profit account that helps cover uninsured medical expenses for Chris & Kim. Any amount donated would be a tremendous help to them and their loved ones since the amount of medical expenses magnitude into difficult financing. Friends of Chris Comer are raising money to pay for uninsured medical expenses associated with transplantation of a new kidney and we need everyones help! Chris has chosen to fundraise with HelpHOPELive in part because HelpHOPELive assures fiscal accountability of funds raised and tax deductibility for donors. You can donate as little or as much as you can and every little bit will cherished. Donors can be sure that funds donated will be used only to pay or reimburse medically-related expenses. For more information, please contact HelpHOPELive at 800.642.8399.